Mermaid braid hairstyles embody the beauty and charm that the braiding art can give to women’s locks. You can choose to give them the elegant appeal of a fishtail, French twist, waterfall, crown, halo, or Dutch twist among other variations. I have searched the internet for styles that will leave a lasting impression and make you the envy of those around. Below are 25 examples of an incredible braided mermaid hairstyles that will make heads turn. 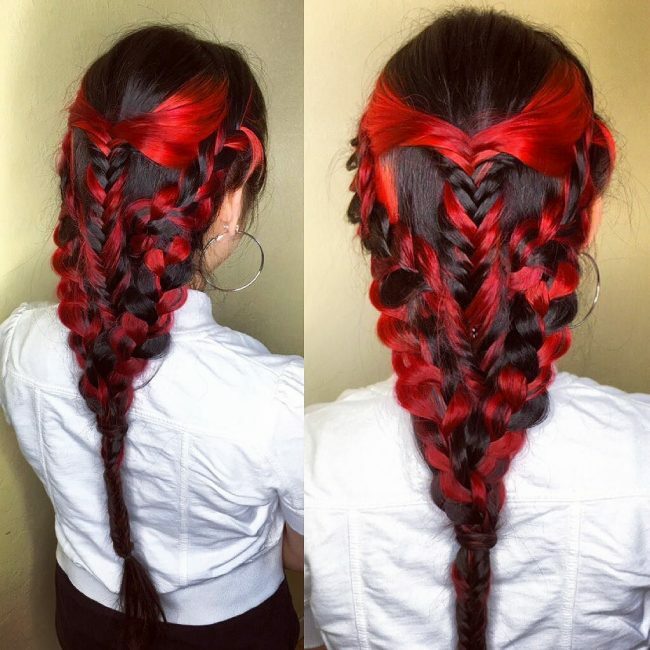 This hair sports a chunky French braid that adds tons of volume to it. The braid is given some loose twists that create more visual appeal. It extends just below the shoulders to create the illusion of a voluptuous fishtail braid. Fresh flowers come in handy to provide an amazing finish for that “wow” look. This style is a perfect choice for women with long brunette hair. Here, the upper front layers are given a spiral twist on each side. The double twists on either side are pulled back and styled into an elegant four-strand fishtail braid. The multiple strands give it a chunkier and soft look. The fishtail is braided long enough to form a perfect wrap that rests gracefully on the shoulders. The hair sports a dark brown shade that is given the glamor of a blonde tone. In this style, the crown is given plenty of volume and thickness. It is braided into a fishtail starting from the nape of the neck. 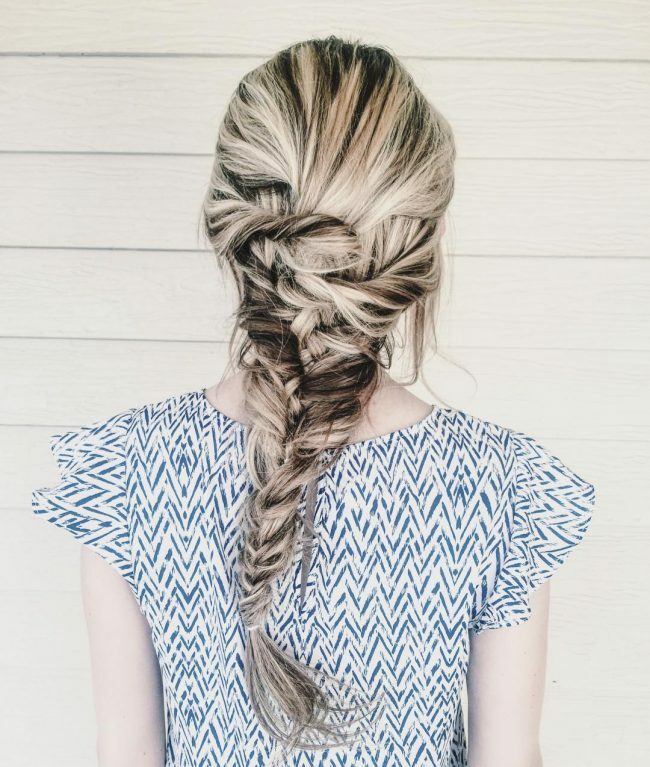 The fishtail is given a loose and messy look that creates some drama in this style. 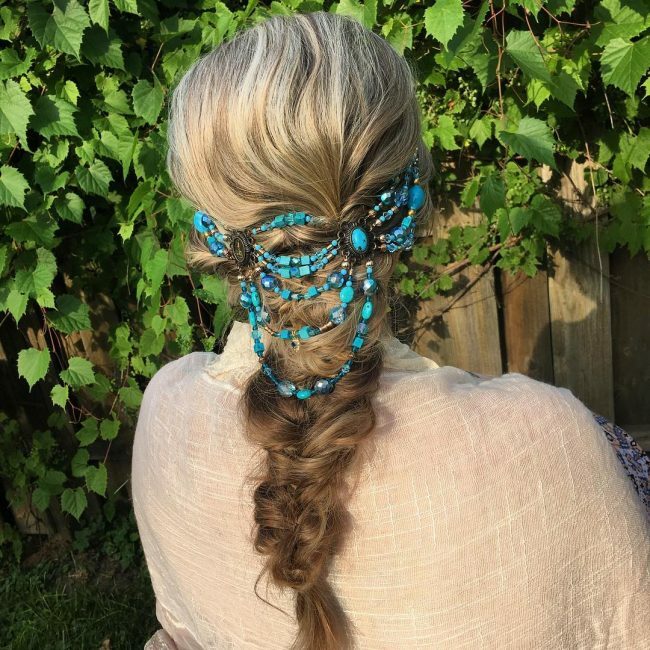 The hair is given an ash blonde hue that creates a perfect background color for the vibrant blue jewelry. 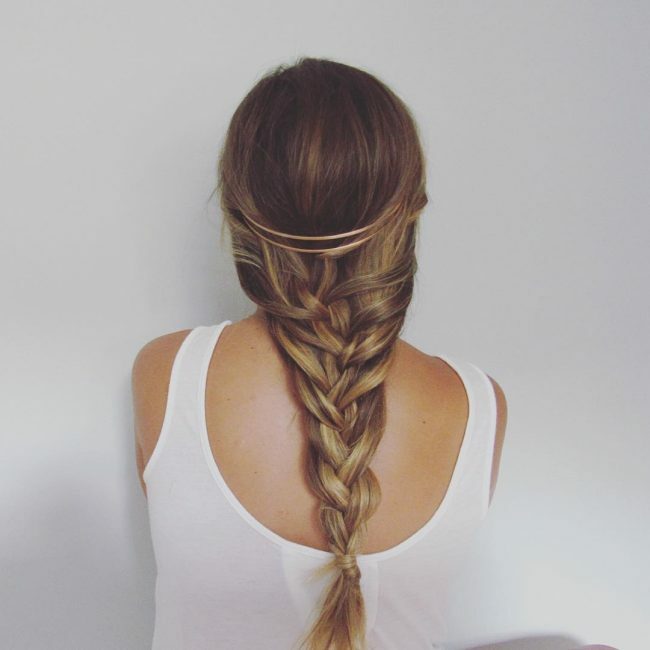 Here is a braided mermaid hair that sports plenty of length. 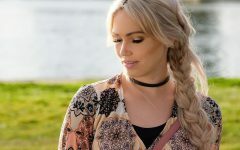 The braid is achieved by pulling back the hair at the sides and twisting them together to create an elegant Dutch braid. 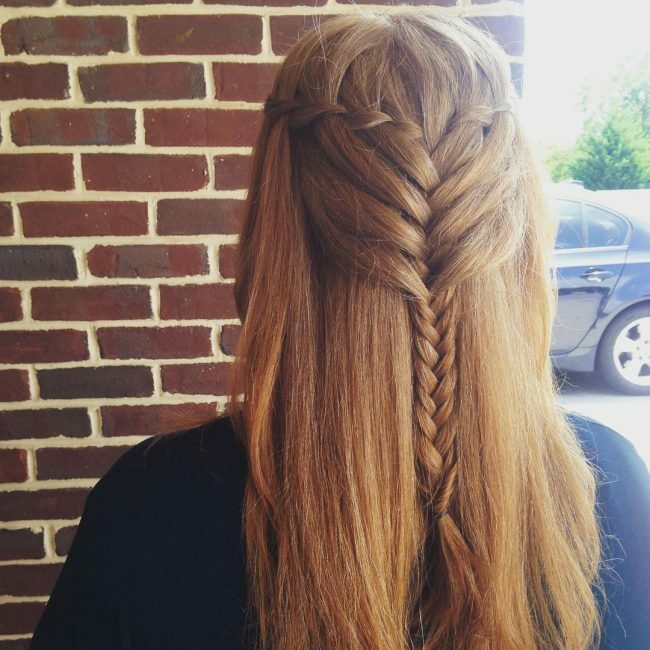 The braid starts from the crown and extends far way below the back. It is given that messy look that adds more fun to this style. Flyaways come in handy to give the hair a soft touch. A golden blonde tone makes this style radiate with beauty, especially during summer. The messy look in this French braid goes a long way in adding a dramatic touch to it. Loose twists accord it with some extra volume. The style sports a soft touch, thanks to the flyaways left intentionally for the purpose. Clipped on flowers make the hair have some freshness to it. The hair has a lovely blonde tone that is given the sparkle of silvery highlights. This style provides a more vivid look by adding tons of volume to the hair. The strands on the sides are pulled back into a chunky fishtail that is given the elegance of a French twist. The fishtail is styled loose giving the hair a fluffy and soft look. This style sports a nice ombre touch that transitions from a dark brown top to blonde bottom. This is where you get some diversity in a mermaid hairstyle. It sports a harmonious blend of the French and fishtail styling. The tops locks are pulled back and given a French twist starting from the nape of the neck. The hair at the sides is pulled back and twisted into an intricate fishtail that cascade down the chunky French twist. 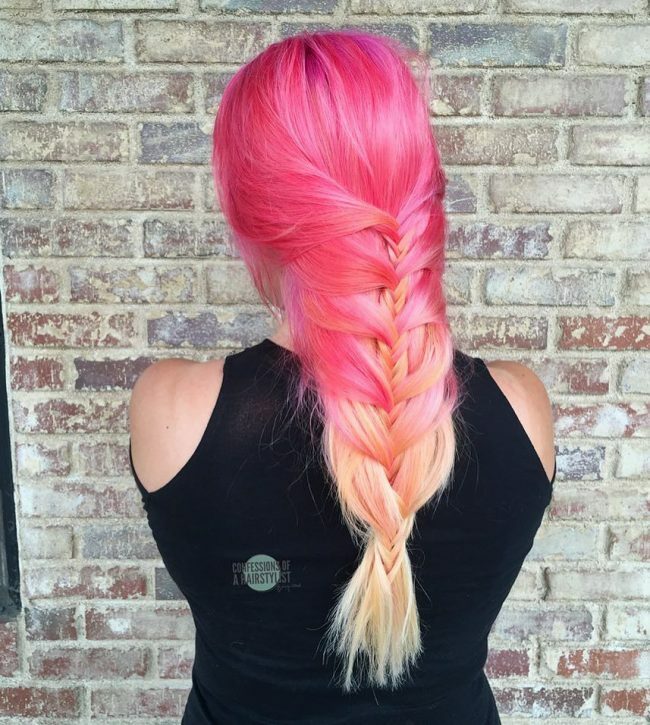 The hair sports a pastel ombre look that transitions from a vibrant pink top to blonde bottom. It creates a stunning sunset mermaid color. A voluptuous crown sits high in this mermaid hairstyle. The strands at the front are given a halo twist that wraps around the head to create a perfect crowned look. The top locks cascade through one loop of the halo extension to create a nice ponytail. A section of the side strand is twisted into a side braid that extends to the bottom. 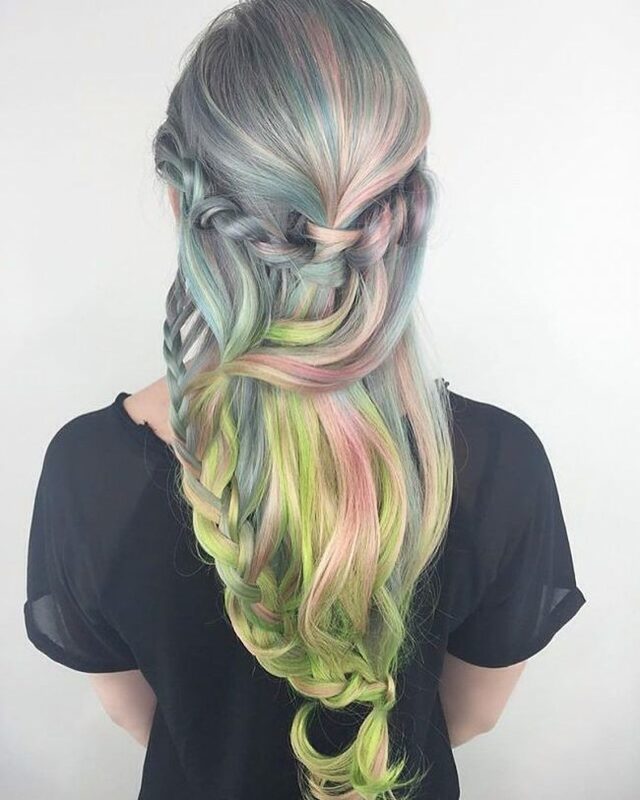 The hair is given a silky smooth finish and adorned in pastel rainbow look. The strands at the front are given a Dutch plait that starts about an inch from the forehead. This is performed on each side to create a double twist. The two sides meet just below the crown where they merge into a single fishtail plait. The hair at the top and sides sport a sleek look that creates some glitter in this blonde mermaid hair. The long fishtail is given a messy French twist with lots of flyaways for that soft and delicate touch. Side bangs come in handy to create a more flattering look while adding some little drama and fun to the style. The hair is given a golden blonde touch. A flower crown completes the whole look in style. Here, the sides are given one nice sweep to the back. An elegant merge is created at the back by twisting the sides together with the top to form a loose fishtail that hangs just above the nape of the neck. 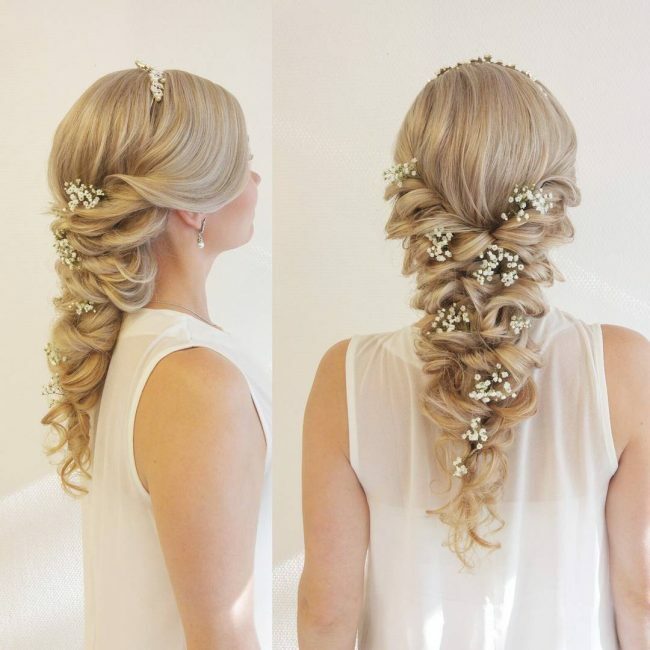 A jewelry crown and flower clippings make this style absolutely stunning and a perfect match for wedding parties. 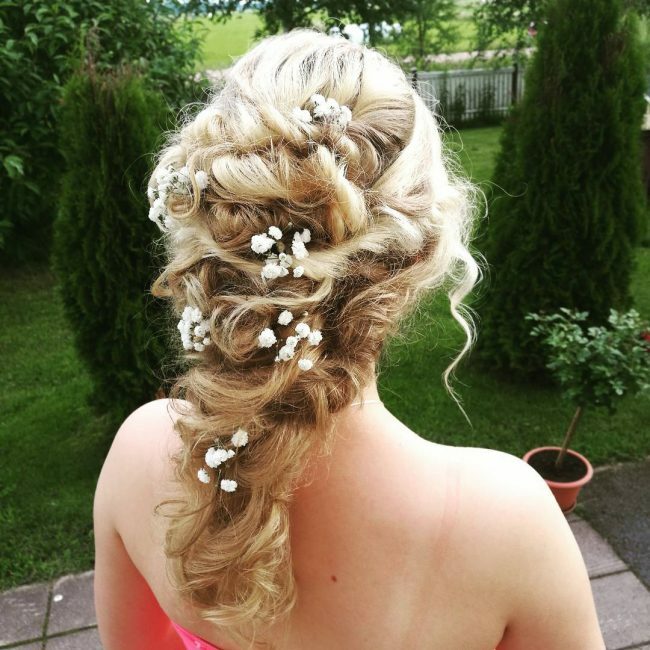 The hair sports a blonde tone for that amazing summer wedding. Want to take the elegance of a waterfall hairstyle to a whole new level? Well, you can do that by giving it a diagonal twist that is both unique and simply elegant. The hair is styled into wonderful waves that cascade effortlessly to the bottom. 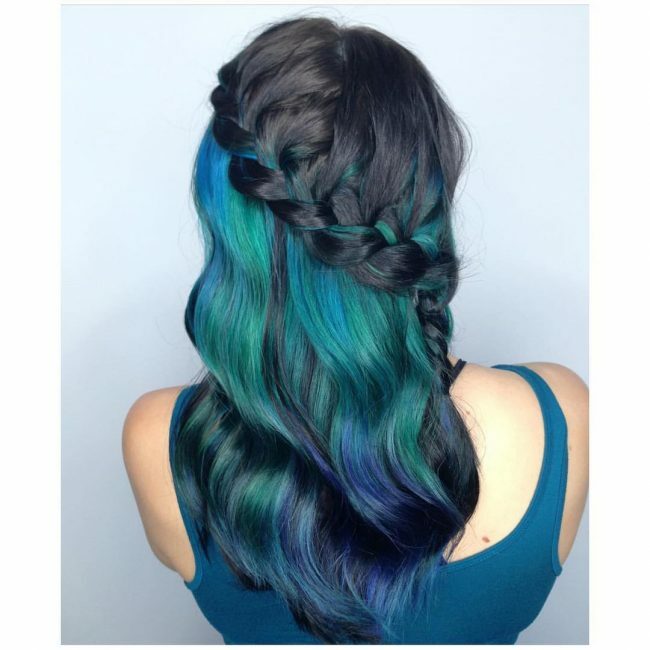 It is given a balayage ombre look that transitions from dark brown to balayage highlights of blue and mint green. This fishtail with a French twist is given a shadowy appeal created by the dark shade at the roots. It sports a messy yet elegant look that has some volume for that vivid look. Wisps are left at the sides to create flattery face-framing pieces. The hair has balayage highlights of blonde that will definitely warm up your day. 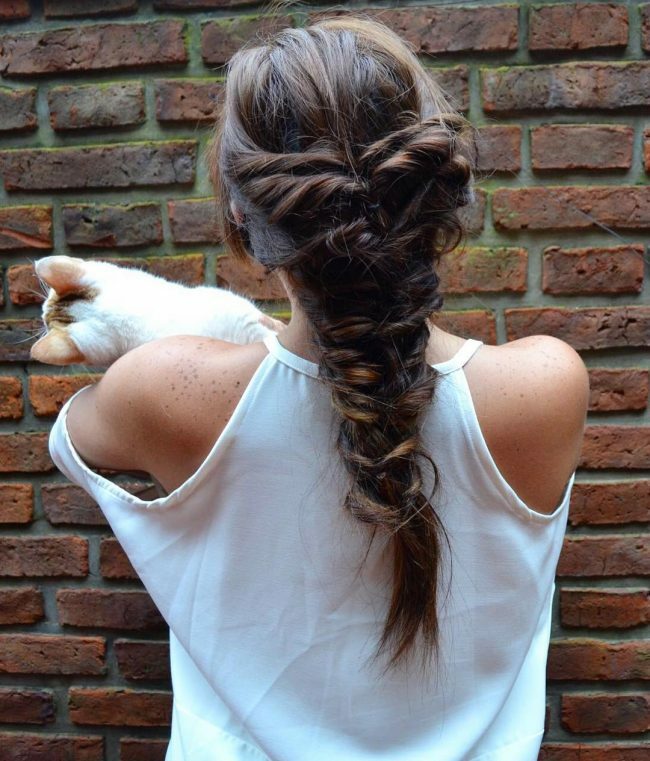 This is an elegant take on a combo braid. It sports wonderful French twists on each side that merge into a fishtail at the nape of the neck. The locks are given that rustic blonde look that provides a wonderful display for the summer season. This is a cute hairstyle that looks great on young girls. 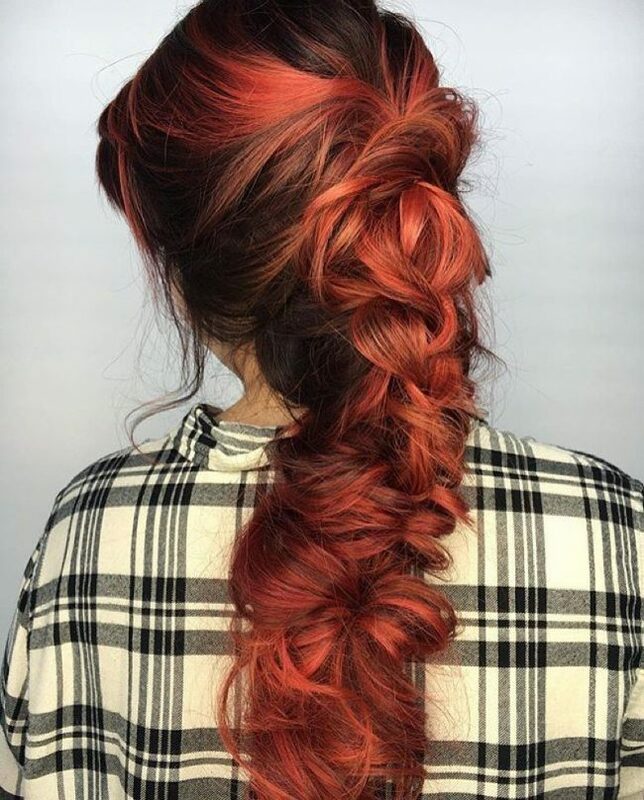 This is a nice take on a French twisted fishtail. The style sports long locks that are given an intricate twist to add some sophistication. It is given a soft ombre touch that transitions from ash blonde at the top to silvery blonde at the bottom. The style is given the flattery look of side bangs. This style brings together the two worlds of French and Dutch twists. 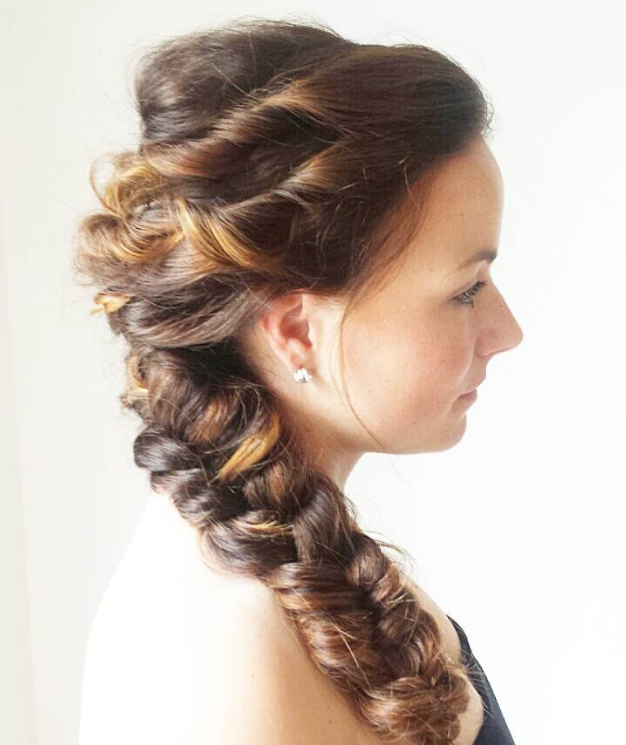 The strands at the front are woven into a Dutch braid to grace the sides. 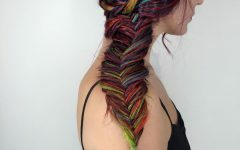 Part of the strands at the sides are given a French twist then merging with the Dutch twists to create one chunky fishtail. The balayage highlights of red create the best party style in this dark brown hair. 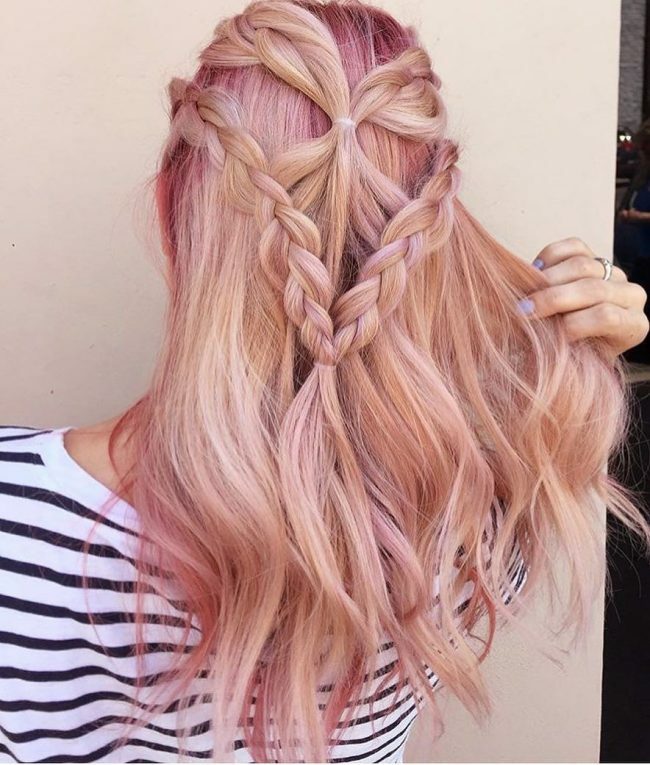 One crown is just not enough to give this mermaid hair the elegance it deserves. The front strands are styled into double three-strand braids that wrap around the head to create an upper and lower crown. The upper crown is given a more loose twist to create some contrast. The crowns end in wonderful ponytails. The hair sports a pink/red to blonde ombre. This style provides the elegance of parted hair. The front strands on one side are pulled back and styled into a fishtail. The fishtail is given a little sweep to make it rest gracefully on the shoulders. It is adorned with lovely pink and red flowers for that fresh finish. The hair is given a delicate ombre that transitions from ash blonde to silver blonde. 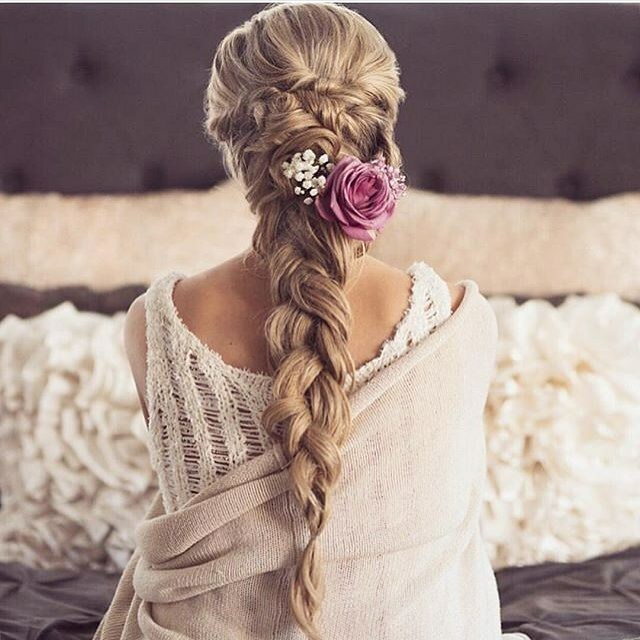 Here is a brilliant way of upgrading that romantic look in your regular three-strand braid. The sides are pulled back and given intricate twists that make this style a hard one to duplicate. 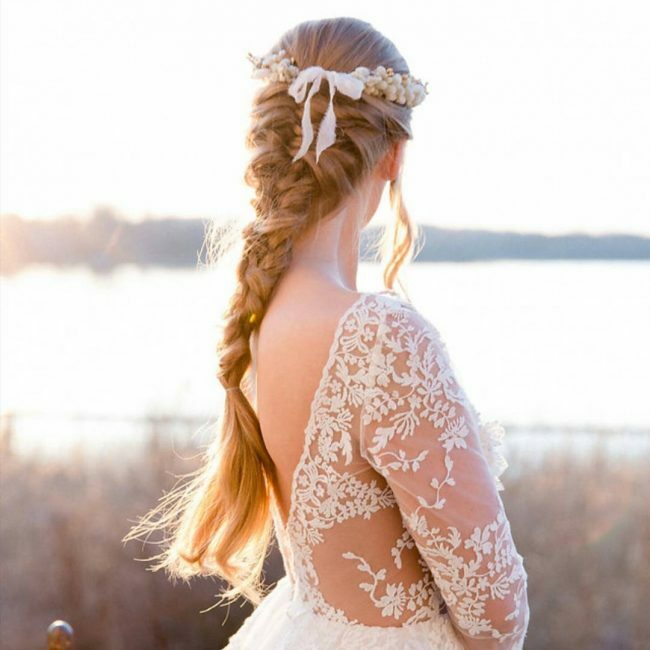 The top locks are woven into a braid that cascades through the intricate twists to grace the back with great beauty. 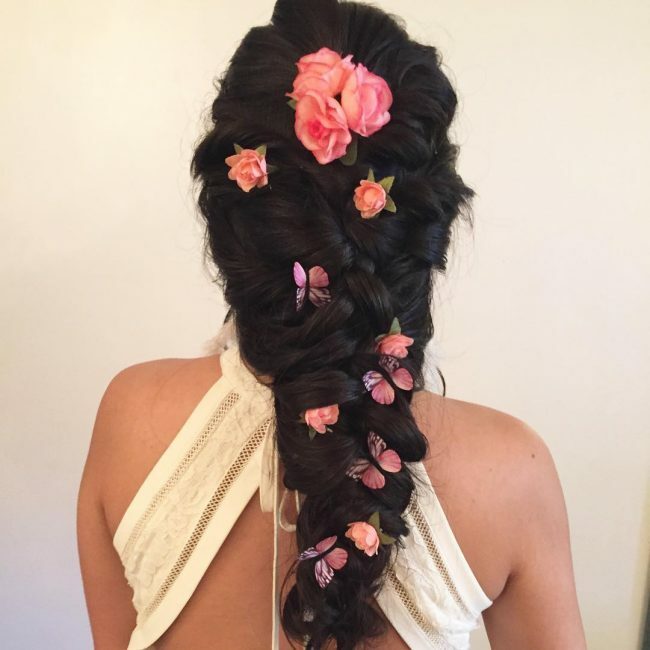 White and pink flowers are added to create a romantic wedding hairstyle. 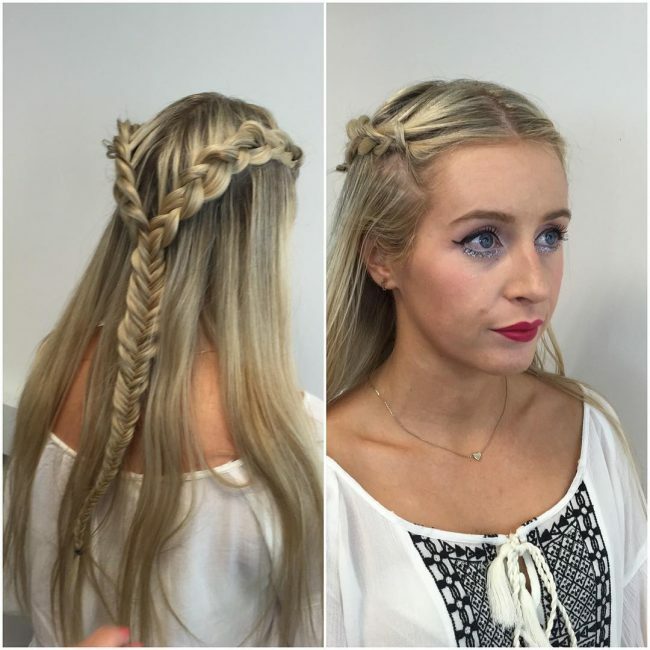 Adding a fluffy touch to a braided mermaid hair doesn’t have to be that difficult. You can do this by styling it into a fishtail that has loose twists that make it d voluminous. Additional softness is achieved by incorporating lots of flyaways. The dark shade of brown is given some flair by highlighting it in red. Who said headbands have to be worn only on top? Well, here is a creative way to do it. 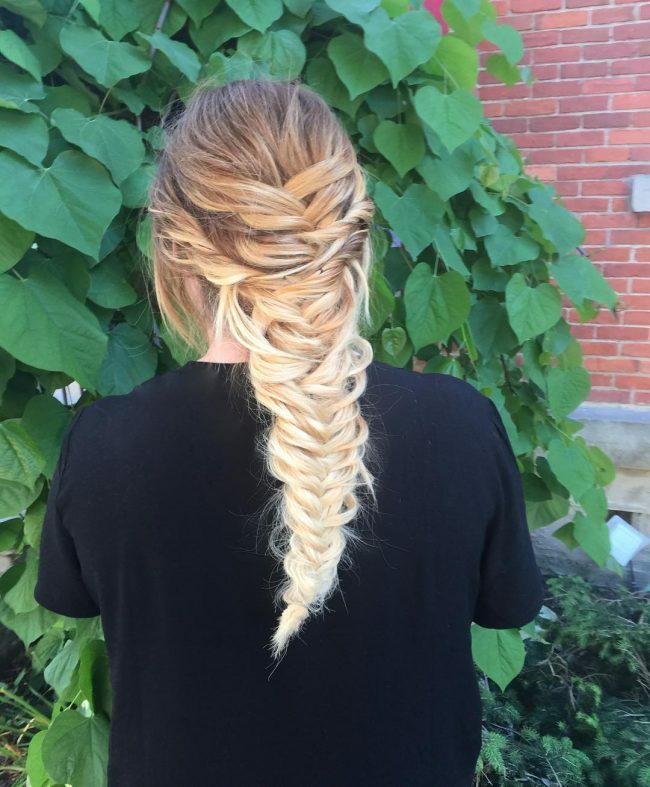 Flip it to the back to add some fun to this fishtail hairstyle. The fishtail provides the intricate touch of multiple strands that gives it a classy and elegant look. The dark brown hair sports balayage highlights of blonde that makes it pop. 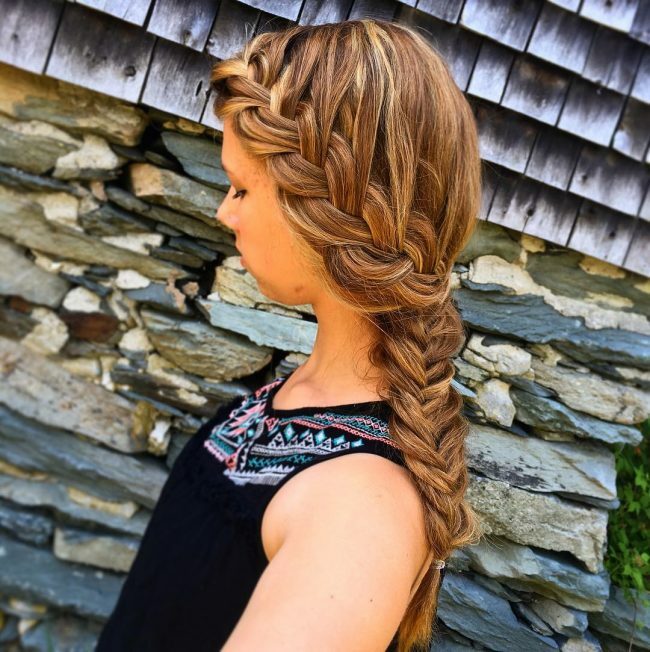 Here, you get waterfall, mermaid, and fishtail braid all in one style! The top strands cascade through the waterfall and merge into a French twist that transitions into an elegant fishtail. The locks are given a silky smooth finish that creates the best look in this blonde hair. The hair is pulled back into a standard fishtail that has the elegant touch of French twists. This is quite a romantic style that sports the dramatic appeal of side bangs and the soft touch of flyaways. The dark brown hue forms a perfect blend with the balayage highlights of a warm blonde tone. 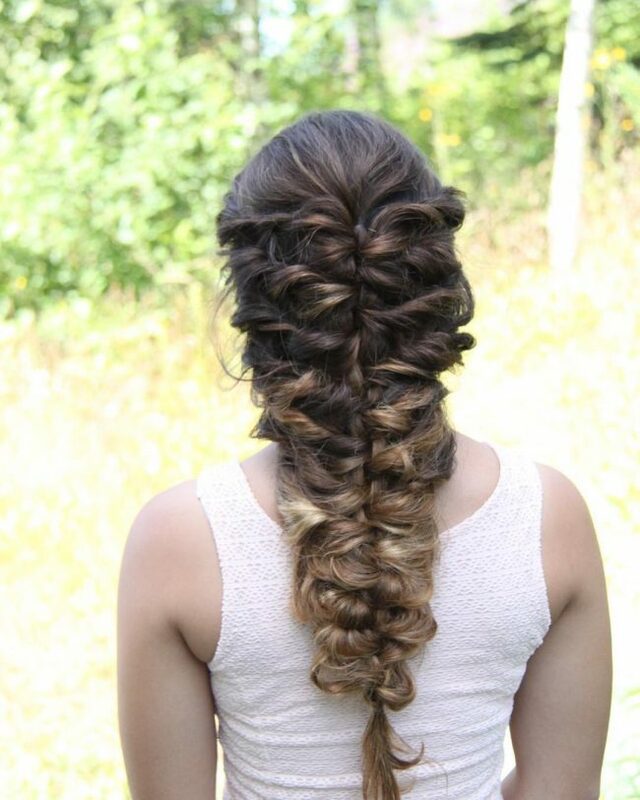 This is a pretty cool mermaid braid that sports a chunky French twist the ends in nice curls at the bottom. The ends are left loose to give the style a more trendier look. The creativity of this style is enhanced further with balayage highlights of blue, mint green and brown. This is a trendy hairstyle for women who desire the elegant touch of pastel hair. 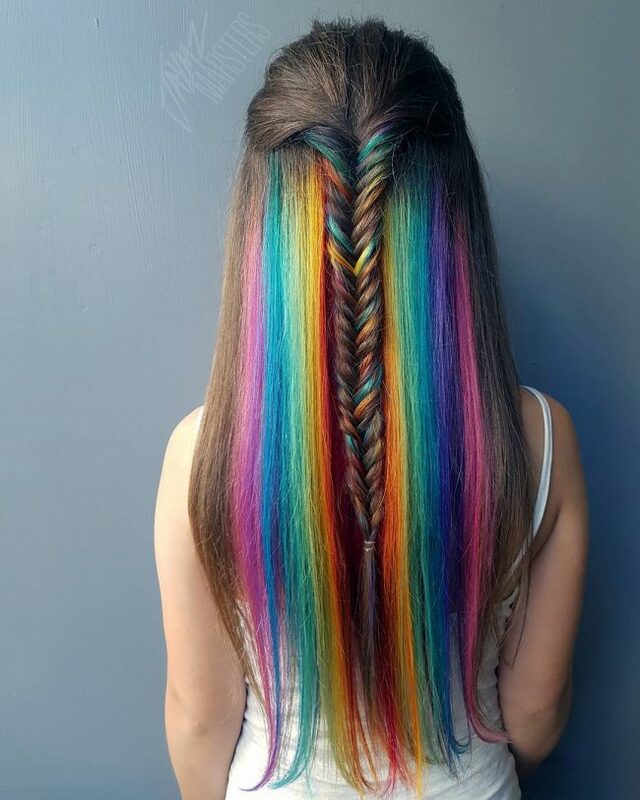 This hairstyle provides the perfect definition of a rainbow look. It sports the elegance of a fishtail that is given a wonderful fishtail plait. 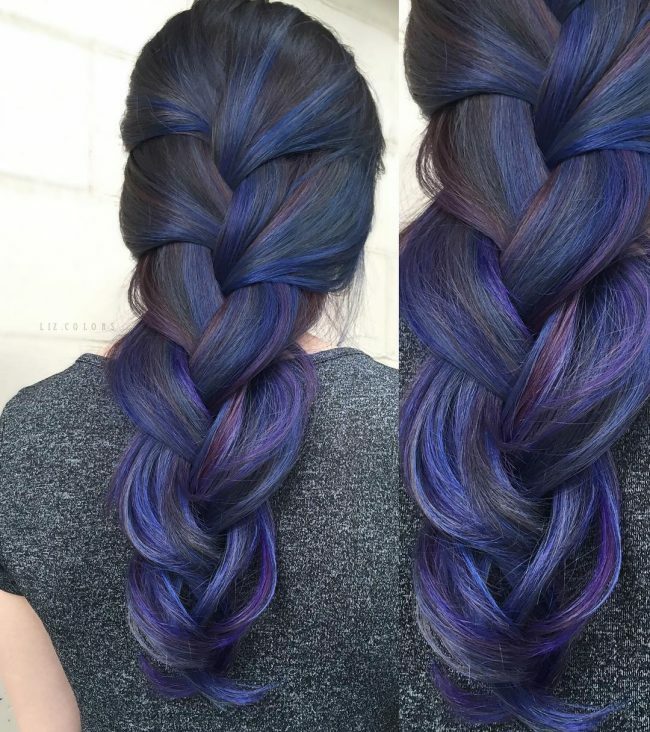 The hair is given a stunning colorful ombre. It transitions from a dark brown top to a rainbow bottom made up of balayage highlights of pink, blue, mint green, yellow and red. Olaplex product is used to give the hair a sleek finish and add some curls to the ends. 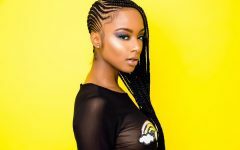 These are some of the most impressive styles in the realm of mermaid braids. They are key to getting positive compliments or even increasing the love that your admirers have for you. These styles provide a trendy look that is both classy and elegant. Try one and take your gorgeous looks to the limits!